This post now available in Spanish! Este blog ya está disponible en español! 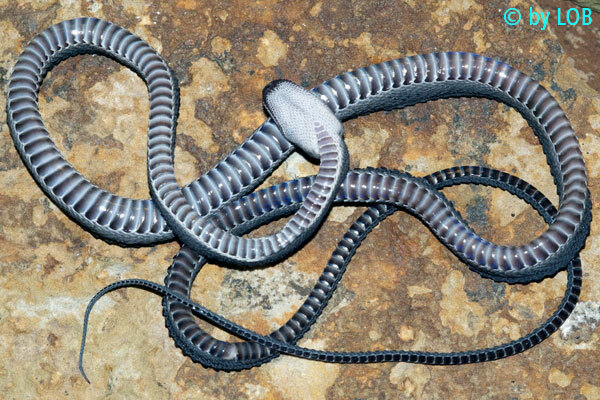 One of the weirdest-looking snakes in the world is Xenodermus javanicus, also called the Javan Tubercle Snake, Javan Mudsnake, Rough-backed Litter Snake, or, best of all, the Dragonsnake. Although they don't breathe fire, their anatomy is strange enough to evoke images of mythical creatures. The first Dragonsnake was described in 1836 by Danish zoologist Johannes T. Reinhardt. 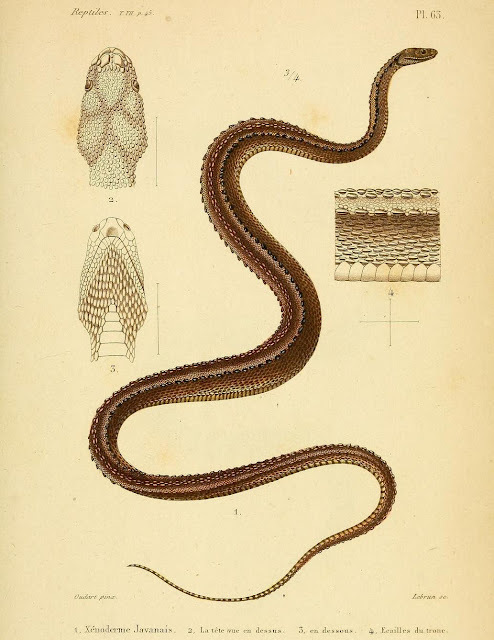 He named it Xenodermus, Greek for "foreign skin", because of its peculiar scales, of which Reinhardt described three types. A triple row of large keeled scales runs down the center of the back, flanked by two rows of huge keeled tubercles that resemble crests more than scales. 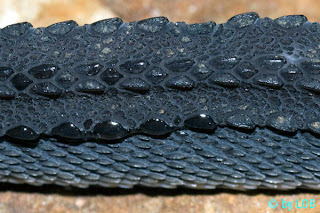 The gaps between these knobby rows are covered in small irregular smooth diamond- and pentagon-shaped scales, whereas the space below the tubercles is coated in more traditional parallel rows of keeled dorsal scales, which nevertheless resemble a highly organized bed of oysters more than typical colubrid scalation. Given the dorsal side only, it's difficult to tell what the taxonomic relationships of Dragonsnakes are. 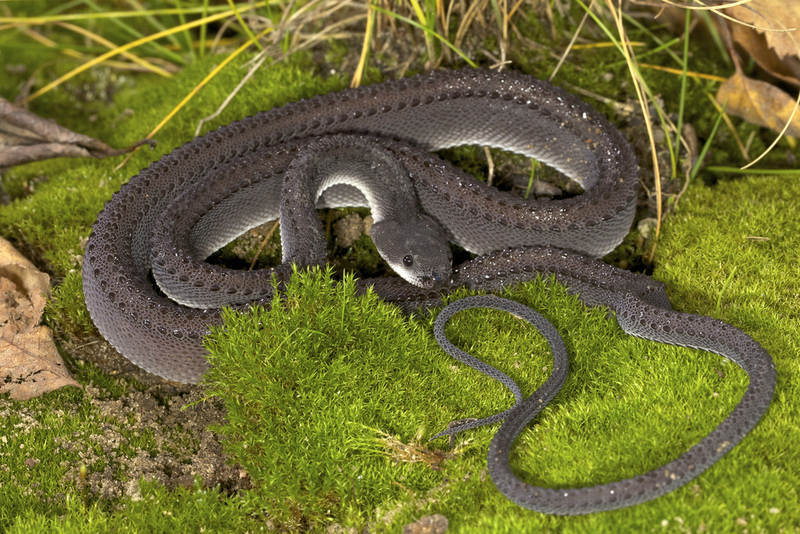 However, you can tell this snake is a colubroid if you examine the ventral side, where wide, well-developed ventral scales are present, unlike the smaller ventral scales of more primitive snakes. The tail, which constitutes up to a third of the total length, has a single row of scales on the underside, a characteristic reminiscent of vipers but also found in some colubroids. Overall, the head is probably the weirdest attribute. 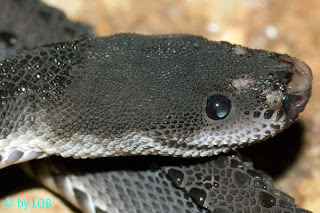 The top, sides, and bottom of the head are covered by small granular scales, similar to those of pythons and other henophidians. 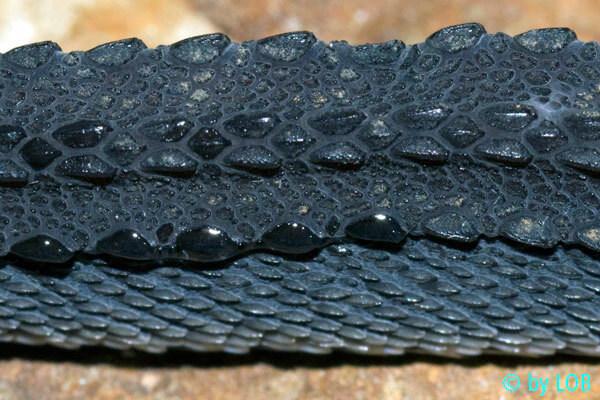 But a few specialized scales grace the nose and lips of Dragonsnakes. These include about 20 labial scales, a small rostral scale at the tip of the nose (impossible to see from above), two large nasal scales, directed forward, enclosing the nostrils, and several small shields in the vicinity of these nasal scales, separated by bare skin. What are all these weird scales for? Why didn't Dragonsnakes evolve more specialized scales, like the other descendants of their common ancestor with colubrids? These are open questions, but the Dragonsnake's environment probably has something to do with it. Another rare Bornean reptile, the Earless Monitor Lizard (Lanthanotus borneensis), has a similar mixture of high- and low-entropy scalation. Dragonsnakes' closest relatives are 16 species of obscure snakes in 4 genera that together make up the family Xenodermatidae. Xenodermatids occupy a position similar to that of pareatids, near the base of the colubroid family tree. Traditionally, both xenodermatids and pareatids were considered subfamilies of the "junk family" Colubridae, but recent phylogenetic analyses all agree that they are only distantly related to other Colubridae, and must therefore be recognized as separate families. Xenodermatids are the most distantly related colubroids, or the "sister group" to all other colubroids, having diverged nearly 50 million years ago at the beginning of the Cenozoic, four times closer to the extinction of the dinosaurs than to today. Intriguingly, one recent article found strong support for a sister-group relationship between xenodermatids and the awesomely bizarre acrochordids, or filesnakes. This small family of three freshwater and marine species is found from northern Australia and the Solomon Islands west to India and Sri Lanka. Dragonsnakes are found in southeast Asia, including southern Burma and Thailand and peninsular Malaysia, as well as on the islands of Borneo, Sumatra, and Java. Although this area was once connected, the isolation of the islands and mainland has probably resulted in geographic isolation among populations of Dragonsnakes. Although no study to date has examined either morphological or genetic differences among Dragonsnakes from different islands, I wouldn't be surprised to see them split up into multiple species once this information eventually becomes available. We know a little about the ecology of Dragonsnakes in the wild. They are active at night, when they hunt for frogs along rocky streams in tropical rain forests, as well as in rice fields. They lay several clutches of 2–4 eggs each year during the rainy season, from October to February. The young hatch after an incubation period of about two months. Apparently when you grab one, it freezes, holding its body stiff, a behavior which you can see well in this video, taken by field herpers in Indonesia. showing in detail the scale anatomy. This plate hangs on the wall in my dining room. 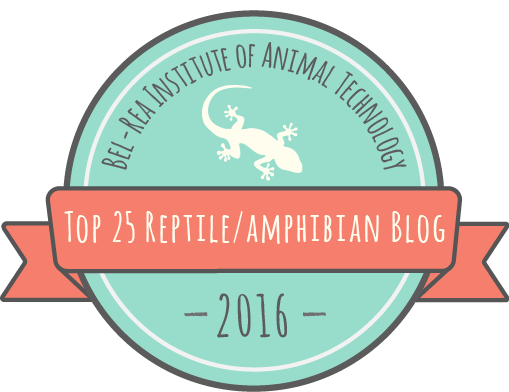 Apparently Dragonsnakes are increasing in popularity in the pet trade, so we may learn more about certain aspects of their biology through the keeping of captive individuals. Hopefully collection from the wild will be kept to a minimum, and somebody one day will conduct a detailed study of Dragonsnake ecology. Thanks to Tom Charlton, Mister Pupkin, and LOB for use of their photographs. Wonder is anyone out there study the relation of this snake with the Rough Cofee Snake (Nothopsis rugosus) from S. America, because morphology wise they looks quite similar, yet they were from different family. Wow, there really is a resemblance. I wasn't familiar with Nothopsis before. It seems that this is one of numerous examples of uncanny convergent evolution found among snakes. An analysis by Vidal et al. 2010 found that Nothopsis are closely related to Leptodeira, rather close to the base of the dipsadine family tree. Fodder for a future article! No, not in a way that is dangerous to humans. I was personally wondering how strong these fangs are? Are they capable of piercing bone? Absolutely not. They are not very strong. Reptile teeth are not set into a socket like ours are, so they cannot really pierce very well, certainly nothing as hard as bone. Dragonsnakes don't really have fangs per se, but even snakes with really large fangs like Gaboon Vipers can't use them to pierce anything hard.